Yet another story in SFFaudio’s 7th Anniversary Carnival of Characters! The moment I realized that copyright was at the center of the story, I thought: Jesse would love this. I’m fairly certain he’s read it, though. There can’t be a lot of fiction where copyright plays a part, and besides; Spider Robinson is one of his favorites. A law to extend copyright is proposed, and Dorothy, an artist, visits a Senator in future Washington to persuade him to vote against. The story is not dry exposition about law. It’s about art, the human mind, mathematics, and the universe. A lot to pack into 34 minutes, for certain, and it did leave me feeling melancholy, like the elephants. It’s important to note that this story won a Hugo Award in 1983, long before copyright ran headlong into the digital age. 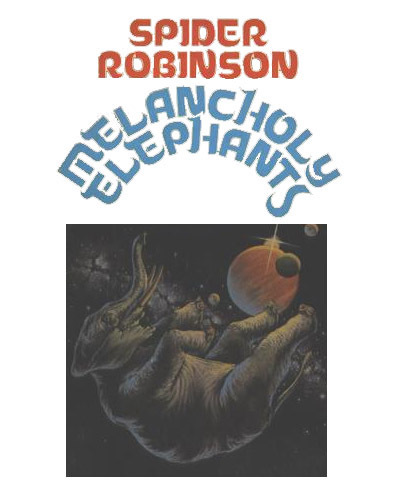 “Melancholy Elephants” stands beside other great science fiction stories that so clearly saw the future coming. The story was read by Spider Robinson as part of his Spider on the Web podcast. And |HERE| is a direct link to the episode with “Melanchoy Elephants”. You be thinking rightly. It is an excellent story about the philosophy of art. It may be my favourite Spider Robinson story.